Please, more Romeo and Juliet in college! 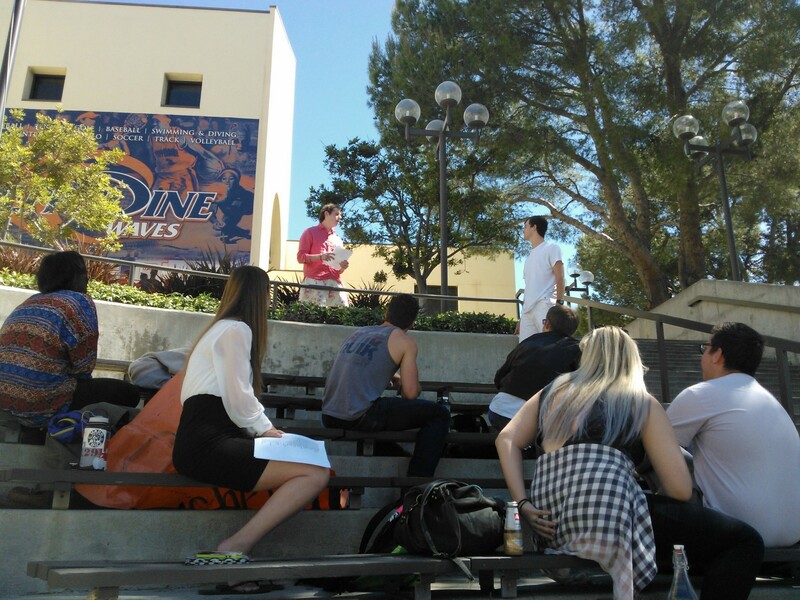 Spring 2015, finals week ~ My class read Twelfth Night, not Romeo and Juliet, but it didn’t keep two students from returning to eighth grade to recreate the balcony scene. There is a contradiction about Romeo and Juliet in America: it is widely performed but little studied in college. The main reason is its elevated position in junior high and high school curriculum, one that rivals To Kill A Mockingbird and The Catcher in the Rye. When I asked my Great Books students about their high school exposure to Shakespeare, Romeo and Juliet took the cake as the most commonly assigned play of all genres. Students cited the youth of the star-crossed lovers and the conflict of their families as primary reasons for the popularity. It is hardly a surprise that theatrical companies and universities target young students and their teachers when offering workshops and seminars on the play. Far less common is its appearance in college courses. From a random survey of some thirty online syllabi of Shakespeare courses from Research I universities to liberal arts colleges to community ones, I found that only a few courses include Romeo and Juliet in their reading lists. Moreover, these courses tend to include a large number of plays, or focus on Shakespeare in film. Rare that it is included in a syllabus with six or fewer plays, and even there, it was assigned alongside a required viewing of a theatrical production. There is nothing wrong with that, of course, but it makes me suspect that Romeo and Juliet is the first to go were instructors forced to trim the reading list. Even earlier The Comedy of Errors and Titus Andronicus seem to be assigned more often, possibly for illustrating the maturation of Shakespeare’s talent in the later plays. Because of the enormous popularity in high school, the near-exclusion of Romeo and Juliet in college is understandable. Besides, isn’t college a time for students to be exposed to more challenging stuff in the likes of King Lear, The Tempest, and Measure For Measure? Or, turning to fiction, it is no disrespect to Harper Lee at all, but you teach Light in August and A Good Man Is Hard To Find in college, not To Kill A Mockingbird. In any event, I can’t help thinking that Romeo and Juliet is worth having more often in a Shakespeare, drama, or literature course in college precisely for the reason that it is already familiar to high school students. Familiarity can bore, yes. But familiarity can also be a chance for greater exploration and new discovery, especially if read in close context of other Shakespearean plays. It is true that the tragedy has been staged often with many comic elements, especially in the first two acts. Still, revisiting it in college may expand the horizon and introduce, say, the proximity between Juliet at the start of the play and Shakespeare’s comic heroines, especially Helena and Hermia in A Midsummer Night’s Dream and Rosalind in As You Like It. Imagine the classroom conversation that compares these characters – assuming, of course, that all three plays are assigned. 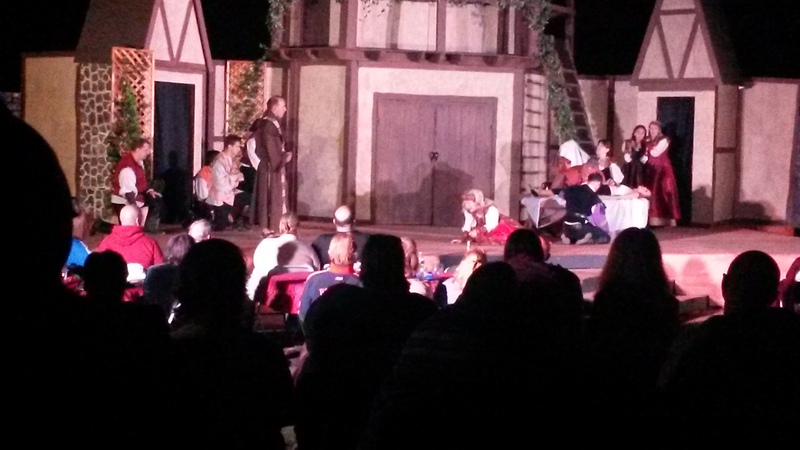 July 2015 ~ Shakespeare in the Vines, Temecula, Calif. ~ The Capulets mourn Juliet’s first death under the watchful eyes of instigator Friar Lawrence. In relation to the tragedies, the basic problem of Romeo and Juliet is its less exalted status. Since at least Nicholas Rowe and Charles Gilden in the early eighteenth century, critics and scholars have pounded this point to death, no pun intended. In the twentieth century, A.C. Bradley, the dean of modern Shakespearean criticism, examines in his classic study only the most mature tragedies, among which Romeo and Juliet decidedly is not. The main reason is the absence of an internal struggle. “Romeo and Juliet, Richard III, Richard II,” wrote Bradley over a century ago, “where the hero contends with an outward force, but comparatively little with himself, are all early plays” (12). Several decades later, Harold Goddard likewise called it “a tragedy of accident rather than of character” (117). Closer to our time, Maurice Charney thought that “Shakespeare has trouble endowing Romeo and Juliet with tragic stature, in some ways they are not tragic at all” because “they definitely don’t bring the tragedy on themselves” and “they have no identifiable tragic flaw or weakness of character” (219). At most, the protagonists have momentary uncertainty and inner tension. When Juliet learned about Tybalt’s death at the hand of her beloved, she undergoes, as Harry Levin once put it, “a crisis of doubt, a typically Shakespearean recognition of the difference between appearance and reality” because “the fair without may not cover a fair within, after all” (282). These occasions do not last long, however, and the characters move on to another twist or turn in the exciting plot. No question: Romeo and Juliet is not as profound as the later works, even if more universally loved. But isn’t this universality an advantage to teach the play (again) to undergrads and have them explore it with fresh eyes? Romeo and Juliet are the perfect pair of lovers. They are beautiful, they are young, they are noble, and they are rich. People get angry about lookism, ageism, elitism, and so on, but, when it comes to Romeo and Juliet, I find that outrage is disarmed, and most everybody becomes a partisan of these youngsters. With envy silenced, even the most sparingly endowed of us gets satisfaction from this love, thus proving that you do not have to make the world ugly in order to compensate us for our defects (7). Since then, the splintering of identity politics has cast more doubt over Shakespeare, exemplified by a recent refusal of a high school teacher in California to teach Shakespeare. I don’t think it will come to the following, but the assumed universality of Romeo and Juliet may end up a last hope for Shakespeare in American some day. Why not seizing upon the advantage to probe Shakespearean depth in the hope that it will lead to greater interest and pursuit on the part of students? There are many ways to further it in college, starting with language, which tends to be the biggest block to student interest in Shakespeare. Both a play about youth and a youthful play, Romeo and Juliet is nonetheless “furiously literary,” to use Mark Van Doren’s lovely phrase. It is a tragedy “crowded with life” but also “with clevernesses,” including images as varied as poison and the grave on the one hand and, on the other, reading and books (52), of which Juliet’s You kiss by th’ book is merely the cleverest and most succinct. Countless junior high and high school students have memorized the balcony scene. They might even study intersections of the holy and the carnal during the first kiss scene. But aren’t there many other passages, especially from other characters, worth visiting (or revisiting) so to deepen and further one’s previous exposure to the play? The earth that’s nature’s mother is her tomb. As in the Garden Scene in Richard II (3, 4) the meaning of the play is formulated in choral platitudes. It all seems too neatly balanced and antithetical, and the Apothecary who sells Romeo poison is a more vibrant character than Friar Lawrence – he is certainly not so long-winded. I think it no accident in the play that the Friar means well but brings disaster. Why does his vital letter to Romeo never arrive? Why doesn’t he stay with Juliet in the tomb? Why is he so enmeshed in secrecy and ingenious devices that tragically misfire? The tragedy is compromised by the Friar’s blundering finickiness (221-222). I don’t mean to say that this is the only view about the friar; far from it. But some discussion could be devoted to his oft-quoted opening soliloquy and his other speeches that, I’d wager, few students had a chance to probe at length in the high school classroom. This friar is crucial to the unraveling of the story, and his words and character deserve a closer look. Then there is the place of Romeo and Juliet in relation to the history of Western thought. In a literature class, it can be read after an assignment on Petrarch’s sonnets and interpreted as Shakespeare’s homage to, parody of, or improvement over the Italian humanist. This is a point in Marjorie Garber’s reading of the play, which finds Romeo’s early language “Petrarchan formula, empty paradoxes and oxymorons… stale poetic images that say nothing and mean nothing” (192). Romeo’s poetic development over the course of the story has been well noted. A focus on this linguistic and conceptual nexus – Garber also expounds upon differences between Petrarchan “doting” and Shakespearean “loving” – could prove exciting for undergraduate understanding and appreciation. Garber may be a touch harsh on Petrarch. And no, I don’t mean to arouse the ire of Petrarchan advocates by appearing to say that he is used merely as a foil to Shakespeare. Petrarch should be studied in his own right. But doesn’t the difference in this instance illustrate why Shakespeare holds a larger place than his illustrious predecessor in literary influence and cultural imagination? The idea of love as religion had preoccupied Shakespeare as early as Romeo and Juliet… [The lovers] live and die in a union that exists by transcending the normal interests of society. Once their death brings peace among those who had felt only hatred for one another, Romeo and Juliet become saints to their countrymen. Within the dramatic structure of the play, the suffering of the young couple serves as a Christ-like sacrifice eliminating evil by means of love (220). Death by suicide, of course, is not condoned by Christianity, and here we spot a hint at Shakespeare’s subversiveness. Still, Singer’s point is worth exploring in the class on literature or even religion. (There is of course the debate over Shakespeare and Protestantism or Catholicism, which is a category of its own.) In class discussion, religious and non-religious students alike may be surprised and pleased at various evocations and provocations from a play that they think they knew. Bloom, Allan. Shakespeare on Love and Friendship. Chicago, 2000 (1993). Bradley, A.C. Shakespearean Tragedy: Lectures on Hamlet, Othello, King Lear, Macbeth, 3rd ed. New York, 1992 (1904). Charney, Maurice. All of Shakespeare. New York, 1993. Garber, Marjorie. Shakespeare After All. New York, 2004. Goddard, Harold C. The Meaning of Shakespeare. Chicago, 1951. Levin, Harry. “The Earlier Tragic Form and Subject Matter,” in Modern Shakespearean Criticism: Essays on Style, Dramaturgy, and the Major Plays, ed., Alvin B. Kernan. New York, 1970. Singer, Irving. The Nature of Love, Volume 2: Courtly and Romantic. Cambridge, 2009 (1985). Van Doren, Mark. Shakespeare. New York, 1953 (1939).